Sure, exercise is great! Nobody can doubt that an active lifestyle that includes enough physical training is the best way to lose excess fat, keep our heart healthy and stop the detrimental effects of ageing, among many other benefits. But, do we all know how to train safely, while keeping the results and gains coming? You’re not applying the correct technique to exercises. One of the frequent comments I hear when talking about exercise is “I can’t squat – I have bad knees!”. On most cases, once I take these people through a squat clinic, they hardly complain about it. Proper technique for all exercises (including running) is crucial to keep joints, tendons, muscles and other parts of the body safe while reaping all the benefits. You are not warming up. Let’s say you’re feeling a persistent discomfort on your joints or quads after a long jog. Did you do a bit of warmup before starting? It’s not only about body tissue getting ready for what’s coming – it’s also about our nervous system signalling the involved organs some physical work is on the way. Not warming up raises chances of injury. You are not changing exercises and workouts frequently. Do you run and only run? Or maybe do you only bike commute? Do you do the same routine every single day? 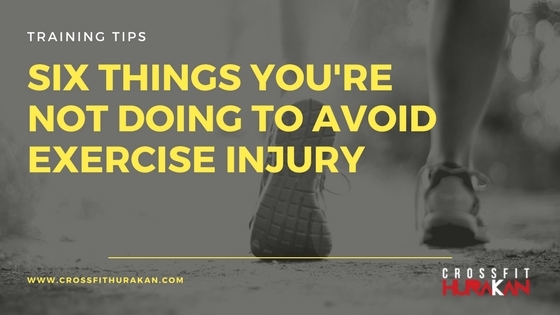 These situations can create imbalances because of uneven strength and weakness across your body, and in some extreme cases overtraining of a certain body part can lead to injuries. You’re not lifting weights. Are you doing only cardio or bodyweight training, with no weights at all? While this might give you the impression you’re doing enough to keep yourself fit and healthy, the absence of weight training will leave your muscle strength seriously limited. Being truly strong means you have more dense and resistant muscle tissue that can support joints and prevent sudden, unexpected movements and physical work in daily life to cause any damage. You’re not eating properly. After a comprehensive training session the body needs to refuel with the proper amount of protein and carbohydrates, so our muscles can rebuild after all that physical work. Don’t mistake this with a license for overeating – otherwise you’ll end up throwing the efforts of your training straight into the bin. You’re not training with a coach. You’ll have a better chance of not making the previous five mistakes if you go through your training program with the help of someone who knows how to help you and, most importantly, pay attention and do what he or she advises you to do. Invest the required time and effort in correcting these mistakes, and you’ll be on the merry path of injury-free training! Feel free to drop by our gym for a free session to find out if your training is as good as it can be.